Postage stamps of British India without overprint were used in Penang (B147), Malacca (B109) and Singapore (B172) since 1854 until 1867. The Settlements being considered part of the Bengal Circle, then from 1861 they became part of the Burma Circle. Straits Settlements were separated from British East India Company and established as a separate Crown Colony on 1 April 1867. Beginning on 1 September 1867, nine types in the existing stocks of Indian stamps were overprinted with a crown and a new value in cents to denote changes of validity in term of area and currency. 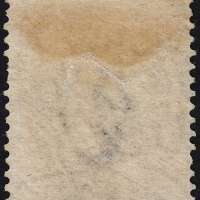 As this particular stamp was originally issued in 1865 and in 1867 overprinted stamps were introduced, therefore it is safe to assume that it was used between these years. The identification for usage in Singapore was through the cancellation obliterator. It is identified as septuple octagonal cancellation of Cooper/Renouf Type 7 obliterator and based on Proud, it is identified as K5. 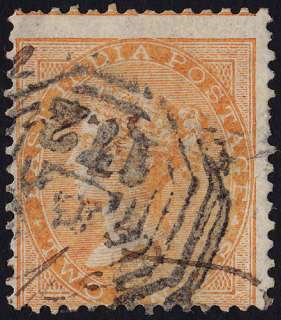 B172 Singapore Cooper/Renouf Type 7 postmark was used from 1856 until 1889 even after separation of Straits Settlements from Bengal Circle. B in the obliteration refers to Bengal Circle. The easiest way to differentiate SG#Z75 and SG#Z86 is that the latter has Elephant's Head watermark whereas SG#Z75 doesn't. 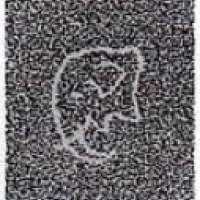 Joy Daschaudhuri of Kolkata, India for stamp and obliterator identification.